The creators of Robotech: GENESIS fan film UEG Productions, receive a cease and desist order from Harmony Gold. This spells the end of the planned web series but brings life to a new project: ARTEMIS. Read more: Genesis Ends . . . . Artemis Begins! The Robotech 25th Anniversary Tour begins at Animation on Display, San Francisco. To keep the news short and simple the only major announcement was that Carl Macek was back on board Robotech. HG did not elaborate on what exactly his role is, sticking to their "less is more" philosophy. Read MEMO1DOMINION's notes on the forum here. Trouble for Anime Expo, since Multiple Anime Expo Staggers Resign in Board Dispute. This according to a source close to the Anime Expo Convention Committee. What does this mean for the Robotech 25th anniversary? Full article here at Anime News Network. 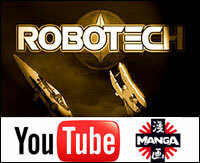 How would you like to watch entire episodes of Robotech for free online? You can now thanks to MANGAentertainment and HULU, who has put up for your streaming pleasure on YouTube, The Shadow Chronicles, all 36 episodes of the The Macross Saga and all 24 episodes of The Masters , and 25 episodes of The New Generation (remastered versions). For now enjoy the episodes anytime you want on your computer or compatible YouTube streaming bluray or tv set or cell phones.